Doorways have been symbolic across cultures for as long as history has been recorded. It’s clear that a door can say a lot and hold a thousand meanings. 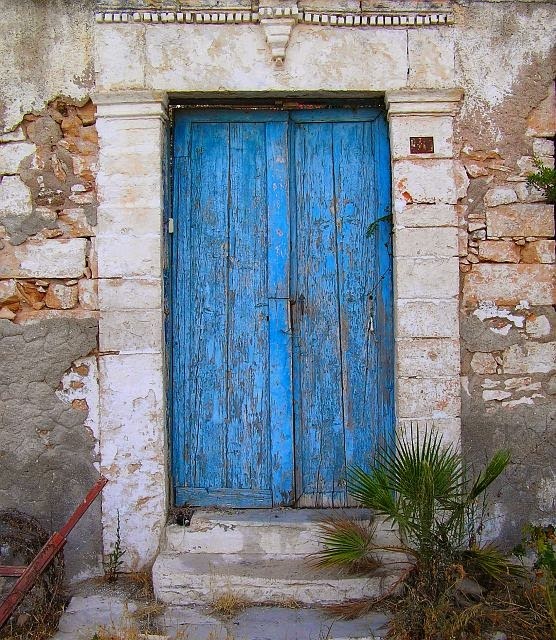 A door is both an entrance and an exit, and thus its ambivalence allows us to see it both as an opportunity or a trap. Just as a door that’s an entrance represents a beginning, a door that’s an exit represents an end. An open door shows that there’s a way out and can also provide a view of what lies ahead. A closed or locked door, on the other hand, can represent a dead end or create the feeling that there’s no way out or suggest danger. To the person standing outside it conveys this message, “You’re not Welcomed.” Doors can lead to adventures, secrets, opportunities and new starts. Remember the old saying, “when one door closes, another door opens.” Since we do not know what lies behind this portal, opening doors always involves a risk. The closed doors are apt symbols of those who live in fear. Nevertheless, when “opportunity knocks”, the door beckons us to open it in order to discover the surprise. And so the disciples of the Lord hid behind what they perceived as the safety of their closed doors, cowering in fear, tending their bruised egos, struggling the make sense of the death of their master, and contemplating the next step for their future. The disciples, these grown men who boasted of accompanying Jesus to his death but fled at the first sight of his gaolers, are meeting in terror – listening for every step on the stairs and for every knock at the door – expecting arrest, and perhaps death. Their imagined invincibility had been thoroughly shaken by the discovery that their all-powerful Master was mortal too, or at least they thought his life ended that way. They were afraid, and they locked the doors! The irony is that they had greater trust in the security of these wooden rickety doors than in the one who declared that He is the “Door”, the “Sheepgate,” the “Way, the Truth and the Life.” There is a failure to realise that although doors may be able to temporarily keep foes at bay, they equally have the capacity to keep out our friends too. But no door can keep the Lord out. Not even a big rock blocking the entrance of a cave tomb could pose an obstacle. Then Jesus appeared. Despite their best attempts to keep out the enemy, Jesus appeared. Despite their best efforts to stay as safe as they possible could, Jesus appeared. God is not stopped by locked doors. Whether we have chosen to shut ourselves behind them out of fear, or whether others have locked the doors upon us, they are not barriers to God. What wonderful news – in our greatest fears, we cannot lock Him out! The disciples who initially hid behind closed doors would be forever transformed by their encounter with Christ and by the power of the Spirit. They have moved beyond those closed doors of that room they crowded into for safety, out into Jerusalem, into the temple itself, proclaiming their dangerous yet life-giving message. And that is what every disciple of Christ is called to do on this Sunday after Easter. We've revelled in the glory of the resurrection, celebrated God's amazing triumph over death and now it is time to get on with what Jesus has commissioned us to do. We too have been blessed and empowered by the gift of the Holy Spirit. It fills us as it filled those early apostles, giving us new life, making us one with God, and sending us out as Christ's witnesses in this world. It is heartening to remember that when we least expect it, Christ will break through locked doors of the human heart. He will find us, in our fear and uncertainty. He understands our misgivings, our hurts, our infirmities and weaknesses. He comes to us not only in power, but he comes to us to demonstrate his tremendous mercy. This, too, is part of the message of this Sunday. Among all the apostles, St Thomas would have understood this part best. St Thomas had adamantly rejected the testimony of his brothers regarding the resurrection of Christ, but Christ did not reject him. In his abundant mercy, Christ gave Thomas a second chance as he gives to each and every one of us. This Sunday, we mark Divine Mercy Sunday, when we embrace the power and beauty of God’s forgiveness. Today is a time for seizing second chances. It is the Sunday in which we remind ourselves of God’s tender mercies – when we strive, more than ever, to let Him break through the locked doors of our hearts. We can step out of the tomb of selfishness and sin. We can feel the healing light of God’s care. We can take that second chance. God’s mercy, Divine Mercy, assures it. The Sacrament of Penance enables it. We can be made new. This Sunday, we have an additional reason for rejoicing. Divine Mercy Sunday or the Feast of Mercy was instituted by Blessed John Paul II in the year 2000, in response to a direct request by the Lord Jesus to St. Faustina Kowalska, whom Blessed Pope John Paul II canonised that year. It would therefore make perfect sense that the canonisation of the pope responsible for the institution of this feast together with Blessed John XXII, another great pope who convened the Second Vatican Council, would be celebrated today. Both saintly Popes were characterised by their ‘open door’ policies, John XXIII for calling on the Church to open its doors and windows, and John Paul II for advancing the Church into the world, thus witnessing to a gospel that reaches beyond national borders and closed doors. We all need the example and the prayers of these two saintly Popes. The locked doors served to keep the fearful disciples safe from arrest on that first Easter. But they did not keep Jesus from appearing among them and offering them peace and the power of the Holy Spirit. The doors did not keep them from conquering the world with the message of God’s love and mercy. Today, though the world is becoming increasingly globalised, it is still much easier to stay behind the false security of locked doors, high walls, in our homes, in our schools and universities, in our places of work and entertainment and in our political discourse and decisions. What a needed gift of Divine Mercy are our two new saints! In health and in sickness, in life and in death, on earth and from their place in heaven, these two popes echo the words of Jesus and remind us once again, “Peace be with you! Be not afraid.” Be not afraid to give witness to the truths and values which we receive from the Church. Be not afraid to stand up for our Catholic faith in private and in public. Be not afraid to live a countercultural life according to the Gospel. Be not afraid to open the doors of your heart and to allow His Divine Mercy to fill the emptiness of your lives. For in so doing, like Blessed John XXIII and Blessed John Paul II (soon to be called Saint John XXIII and Saint John Paul II), we will continue to give testimony to the Risen Lord, the Fount of Divine Mercy, who has conquered death and defeated the powers of Hades, and invite Him into our own locked upper rooms and pray as well that He will break through all the barriers that might be keeping Him out of lives. The closed doors are apt symbols of those who live in fear. Nevertheless, when “opportunity knocks”, the door beckons us to open it in order to discover the surprise.